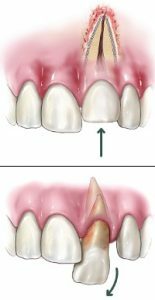 Chipped ToothMost chipped or fractured tooth crowns can be repaired either by reattaching the broken piece or by placing a tooth-colored filling. If a significant portion of the tooth crown is broken off, an artificial crown or “cap” may be needed to restore the tooth. Dislodged ToothDuring an injury, a tooth may be pushed sideways, out of or into its socket. Your endodontist or general dentist will reposition and stabilize your tooth. Root canal treatment is usually needed for permanent teeth that have been dislodged and should be started a few days following the injury. Medication such as calcium hydroxide may be put inside the tooth as part of the root canal treatment. A permanent root canal filling will be placed at a later date. Knocked Out TeethIf a tooth is completely knocked out of your mouth, time is of the essence. See an endodontist or dentist immediately! Handled the knocked-out tooth very gently, avoiding touching the root surface and follow these steps to protect the tooth. 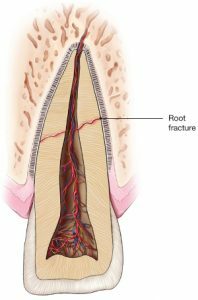 Root FractureA traumatic injury to the tooth may also result in a horizontal root fracture. The location of the fracture determines the long-term health of the tooth. If the fracture is close to the root tip, the chances for success are much better. However, the closer the fracture is to the gum line, the poorer the long-term success rate. Sometimes, stabilization with a splint is required for a period of time.